One day, King Panchal attacked the kingdom of king Sarvan. Panchal's army was bigger and stronger and soon defeated Sarvan's army. Sarvan had to leave his kingdom; he started living in the forest. One day, Sage vashishtha came to his home. Sarvan asked the sage to bless him so that he could win his kingdom back. Sarvan collected his army and challenged Panchal to a battle. He fought very bravely and won his kingdom back. 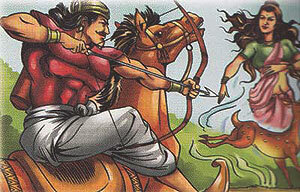 Tapti, the daughter of Surya, the sun god, had seen the courage of Sarvan in the war and fell in love with him. She decided to find out whether Sarvan would be willing to take her as his bride . After becoming a king again, Sarvan went hunting. He saw a beautiful dear in the forest and chased it. After some time the deer suddenly disappeared and a beautiful woman appeared before him. She glowed like gold. The moment he set his eyes on her he fell in love with her. He asked her who she was and she told him that she was Tapti, the daughter of Surya. Sarvan expressed his desire to marry her. Trapti said that he would have to seek the permission of her father. Sarvan started performing tapasya to please Surya . After twelve days, Vashishtha came to him and said that he himself would take his proposal to Surya .